If you have even the barest outline of a plot in mind, think about the kind of character you want to make that journey. What type of person would struggle, grow and triumph in that scenario? What type of person would generate awesome, say, action scenes (or whatever style scenes are appropriate) in that scenario? What type of person/profession/skill set are you comfortable with writing? Doctors may not want to write about lawyers, and lawyers might not want to write about doctors. Note: I didn’t say shouldn’t; this is about what you are comfortable doing. See my comment in a prior blog post about how Alex made me throw this advice out the window. Once you have a main character(s) and a plot, often the secondary characters will create themselves from the plot. You need a mid-level military leader who will face a conflict between his integrity and the orders of his superiors and who ultimately does the right thing (or wrong thing)? It’s not difficult to imagine what such a person might be like…and you’re off to the races. A lot of writing advice will tell you to look around you to the people you know when creating characters. There’s certainly nothing wrong with this (particularly if you know cool people), though you should use some caution when doing so. Either tell the person you’re basing a character on them beforehand, or change enough characteristics for them to be unrecognizable, or better yet, both. And while this approach can work for secondary characters, for any POV character and certainly for your main characters, you are going to need to know a lot more about them than their public persona. The truth is, there are very few people in life we truly know. For most people we at best know what they are like around others and some of their “life story.” For a POV character, you will need to understand the way they think in their head, the way they view the world and themselves, their preferences and prejudices, their secret dreams and fears. For starters. Now, you can sit down and come up with all these facets of a character—but if you do it all willy-nilly you may very well end up with a cobbled-together patchwork mess. Contradictory personality characteristics, temperament, motivations, etc., result in a character who isn’t believable or compelling. Okay, so what do you do? 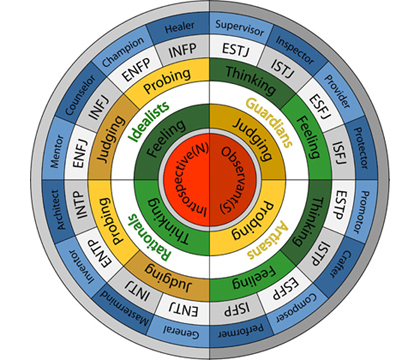 One of the most helpful tools I’ve found in character development is the Myers-Briggs Type Indicator (MBTI). It’s probably the most well-known personality categorization model. If you’ve never taken the test yourself, I recommend it; I personally found it uncannily accurate (INTJ ftw). But you don’t need to take the test to use the model. MBTI groups personality features along four dimensions, resulting in sixteen distinct personality types. Review the type summaries here and here. Think about which of these your character most closely fits. For slightly different visualizations of the types, try here, here or here. If you want to read a more in-depth description of a type, you can go here or here. While these types are just guidelines, a character should ultimately fit fairly well within one of them. Determine which one it is, keep the description of that type around, and include the type in their character sheet (more on that in a moment). 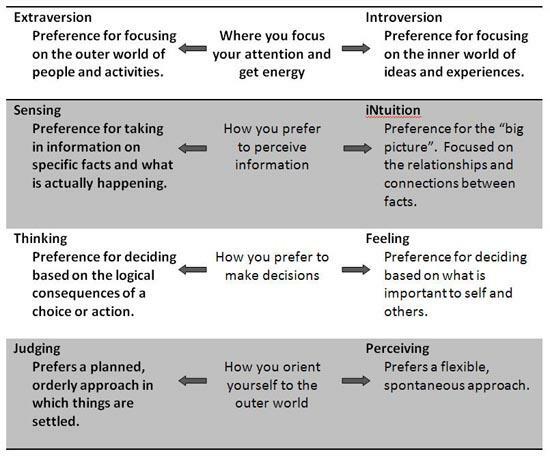 Because even MBTI doesn’t cover every aspect of a person, a slightly different take I’ve found useful is the Dominant/Submissive—Drive (Moralistic/Hedonistic/Realistic) matrix (info here and here). This is complimentary to MBTI, so you should be able to place a character in both matrices. 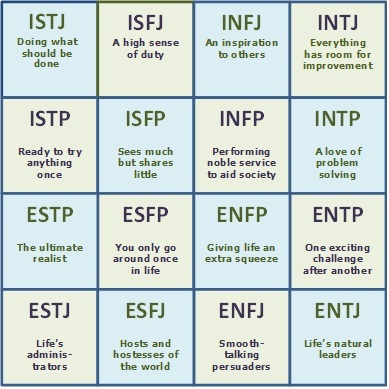 The second link includes examples of pop culture characters of each type, which is helpful in demonstrating how a type operates in practice (This site has similar examples for MBTI types). There are of course many other (probably infinite) approaches to classifying personalities; arguably any of them can work, so long as you use the same approach for every character. Also, it probably goes without saying, but don’t give all your characters the same personality type; it makes for a rather bland story. You don’t need to hit all the types, but try to have a nice spread. Now comes the Character Sheet. Okay, you can do the character sheet first; I personally find it much easier to do once I know who a character fundamentally is. There are literally thousands of character profile templates available on the internet. I find most of them far too long and complicated; you’ll never get around to the writing if you spend all your time filling out pages and pages on every character of note. What you need to know about your character will vary with each story. How old is the character? Where/when is the story set? What genre is the story? Don’t feel like you must fill in every single blank of whatever template you choose if it's not relevant. The character should also have at least a basic background story (birthplace, status and type of parents, good/bad childhood and why, profession, a few notable events); for all but the most important characters this need not be more than a paragraph or two. Beyond these elements, include what you need to for the situation. I use this form (uploaded for easy viewing). It was condensed and tweaked from this template. For a more visual approach, this is a nice template (geared a little toward fantasy, but still useful for any setting). If you want to go more in depth, this is a good form. Whatever template you use, keep in mind the personality types you decided upon when you're filling the template out, and make sure the character stays faithful to them. The most important thing is to have a written record of your character. It helps tremendously in discovering who a character is before you begin writing them; even more, it serves as a check while you are writing. Don’t put it aside and forget about it; you should be referring to it every time you write a significant scene with that character (at least for a while). And if a character acts in a way which doesn’t fit with their personality type and characteristics (temperament, strengths/weakness, loves/hates), there needs to be a good reason for it—probably one that stems from some other characteristic you’ve documented. Alex’s sheet is nearly three pages; those for a couple of major characters are around two pages. However, for the vast majority of the characters the sheet is a single page—so it’s not nearly so much work as it seems. None of these tools will guarantee that a character is interesting to read or write about—but they will guarantee that a character is well developed and internally consistent, which is a terrific (and arguably necessary) first step.